1550 map of "The New World"
The map linked to on this blog entry is the first one that shows all the Americas as being one continent and not connected to any other landmass. From page 23 in the biography, this map was published about eleven years after Esteban left Mexico City to find the rumored rich Indian cities to the north, occupied by what are now known as the Pueblo Indians of New Mexico. The map on the book's page 23 is printed too dark to see details. For a clearer image of the map, click HERE. The Great Lakes are shown descending almost to the Gulf of Mexico. Note the depictions of the Spanish and Portuguese flags of the time. The map's title in German refers to "the new islands....against the Orient on the land of India." 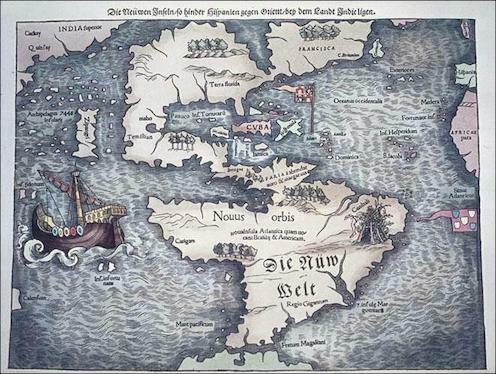 In both Latin, Nouus Orbis, and in German, Die Neue Welt, the Americas are identified as The New World.